A family of travellers which has been camping in Ashbourne town centre will be urged to move to Matlock Bath. In a passionate meeting, Derbyshire Dales councillors agreed a plan to make the overspill car park at Matlock Bath train station a “temporary tolerated” traveller site. The family would be allowed to stay on the car park until March and will have toilet facilities provided. They have been camping on Fishpond Meadows since the start of November. The authority’s chief executive Paul Wilson said that the family’s occupancy of the site was having an “economic effect” on the town, due to taking up a much-needed car park. Council officers said that there were also “issues with ground conditions and confrontations with residents”. Several councillors felt that the traveller family were only being moved on so quickly because they were camping in Ashbourne, despite spending months in other parts of the Dales, such as Bakewell – claiming that the town is given a higher priority. One councillor said that she would resign from the council if a permanent site was not found for the family by March. The authority cannot force the family to move to the temporary site – known locally as Tinti’s Yard. However, the council has said that if the family move to another unauthorised plot or remain where they are, it will use its powers to begin legal proceedings. Opposition councillors on the Conservative-run authority, along with one Tory member, disapproved of the chosen temporary site. This is due to its close proximity to the Matlock and District Rifle Club, which has operated for the last 60 years. Its owners feel that their license could be withdrawn if the travellers are moved to the adjacent plot – due to stringent restrictions. During the meeting it was revealed that the traveller family had been shot at while camping at Old Station Close, Rowsley, in 2013. The authority’s head of regulatory services, Tim Braund, confirmed that incidents had been reported to the police. Mr Braund also said that the Fishpond Meadow site would be difficult to improve and had severe drainage issues. Conservative member, Cllr Vicky Massey-Bloodworth, said that placing the family next to a gun range could bring back bad memories for the family and “scare” them. In response to this, a member of the audience commented “so what”. Cllr Massey-Bloodworth said: “I understand we have to put them somewhere, but there is putting a family that has faced hate and been shot at next to a shooting range. Cllr Martin Burfoot, Lib Dem, said: “I can’t see the common sense of placing a family next to a use of this kind. “I don’t know why we are moving them here for three months. The rifle range is used three nights a week and occasionally at weekends, it has unrestricted access across the proposed temporary tolerated site. Cllr Irene Ratcliffe, Labour, vowed to resign from the authority two months ahead May’s elections, at which she already plans to step aside, if a permanent traveller site is secured. She said: “We have a duty of care here. They need this [a permanent site] now and they need the support. “I don’t know how we can go ahead with putting them next to a rifle range, operating three days a week. “I know we are desperate, but there is nothing worse for them than trying to sleep at night feeling scared. “Collectively we have to all come together to find somewhere. Cllr Ratcliffe said that the council did not move quickly enough to secure the Watery Lane site, in Ashbourne, as a permanent site. 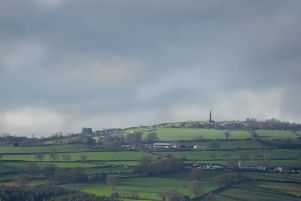 This location, which the district council had pursued for years, is now off the table due to the county council’s plans for a bypass around Ashbourne. This has seen all land purchasing around the town suspended. Council leader, Cllr Lewis Rose, said: “How many times have we sat in this chamber and debated this subject. “We had permission for a site in Watery Lane, in Ashbourne, and had a planning application and a provisionary agreement with the county council. “But we had a change in administration at County Hall and now the Ashbourne bypass has come into prominence. “I am not criticising the county council at all, it is only right that they pursue it. He commented that the site, in Matlock Bath, was more capable of being made fit for use for the travellers. Cllr Lewis said the Ashbourne site was “not a safe place and is causing a lot of problems”. The district council agreed last month to begin a hunt on the open market for a site to buy and make a permanent site for travellers – with six pitches. This was after ruling out all district and county council land. The result of this search is due back in March. Mr Wilson said that the search “may not be concluded by March 2019, it is possibly highly unlikely to be complete the property search by March”. County councillor Judith Twigg spoke at the meeting saying that Bakewell had hosted the family for some six months before they were moved on. Cllr Joyce Pawley said: “They [the traveller family] are frightened about going here, they have, and all travellers have been, been finding life difficult. Clare Herbert, the administrator for the Peak District Mining Museum, based in Matlock Bath, urged the council not to “add to the stress” which the site was encountering. She said moving the travellers to the train station car park “will without doubt lose us further income”. She said the museum is “struggling” as a result of diminishing grant support, closure of the Pavilion toilets and the re-siting of the Matlock Bath Illuminations ticket office. Cllr Albert Catt, deputy leader of the authority, said: “This is a tragic situation and has been for some time. It is a matter which all the members of this council and staff have been trying to resolve not for weeks or months, but for years. “The only solution is a permanent solution. We continue to have instances where members of the settled and traveller communities come into conflict. Ashbourne district councillor Dermot Murphy said: “Clearly I am going to support this as a member for Ashbourne. “I have every sympathy for all the members that will be effected in the coming months. I do mean that. Councillors voted by 12 votes to four to approve making Tinti’s Yard a temporary tolerated site.